Dee Dee's adventure with the dolphins led to much discussion, in particular from cruisers with dogs wishing to learn from our mistakes. We continue to receive inquires about our next phase of lessons learned, so thought it was a good time to catch up on where we are. We are looking at two enhancements to our canine crew equipment, better harnesses and some sort of tracking/alarm device. The alarm device has proven to be rather difficult. Jeff has spent many hours researching and contacting various companies with nothing really accomplishing what we are looking for. He has a lead on a new device coming out soon. I think it best that he address that in a future posting. I took on the harness issue and have to admit there is not a perfect solution... sigh. It is still useful to pass on what I have learned and what we plan on using next. It feels a bit like the three bears but without the one that is "just right." Several of you sent information about a harness made by Ruffwear that looked more substantial than the Kong harness we had been using. So I tracked down Susan Strible, Director of Marketing at Ruffwear who read about Dee Dee's adventure before spending time with me on the phone. 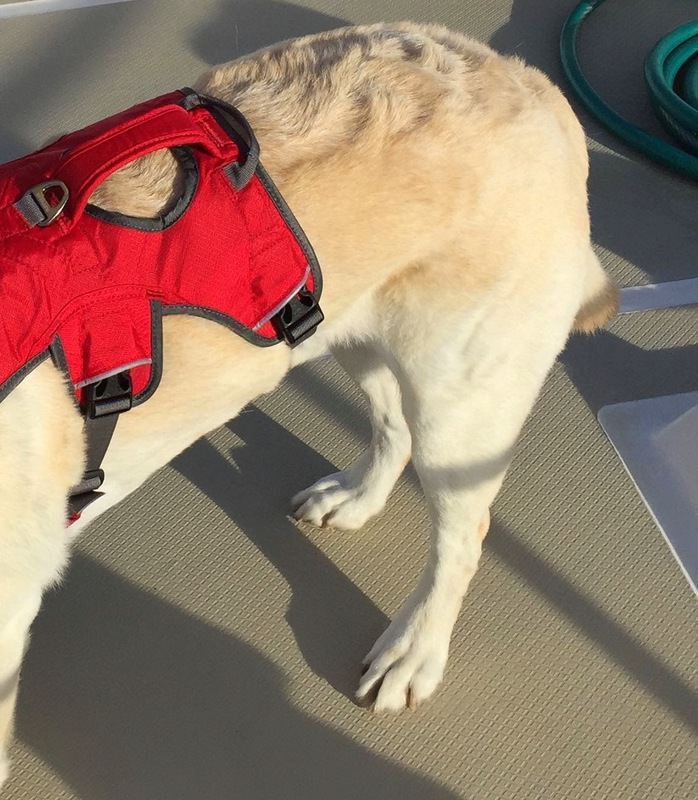 I was familiar with the company having selected their canine life vests after a long search when we first began cruising 12 years ago. I still think they're the best option out there. You can read a bit more about that in the most viewed blog posting on TakingPaws, All That Dog Gear. I must say that it was instantly clear that Ruffwear is passionate about what they do. It comes out whether you are watching their videos, reading their product information, or talking to their Marketing Director. 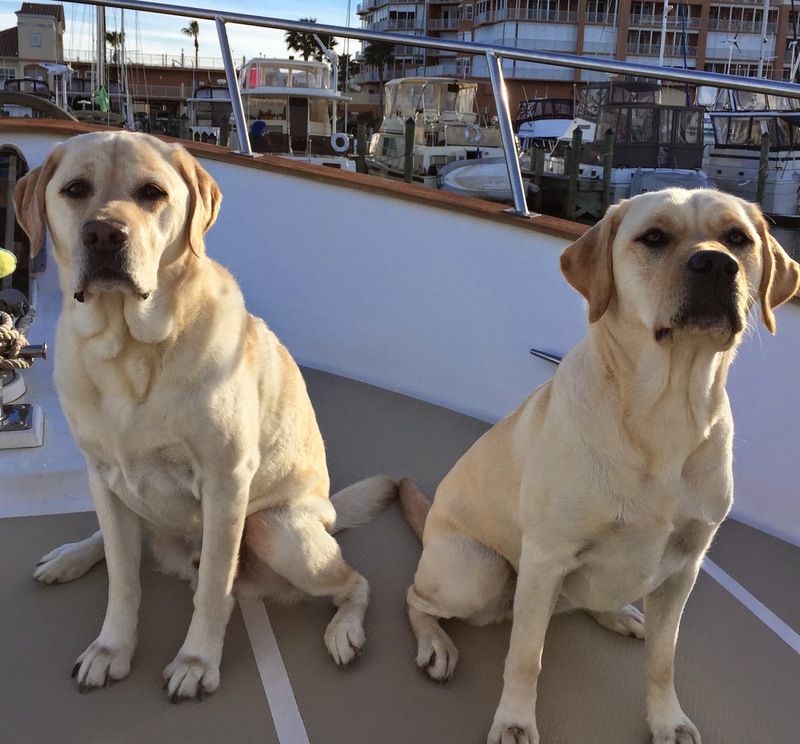 Susan has her own Lab and understands the importance of keeping our canine family close and safe. The first thing she did was to educate me. Who would have thought there was so much to a "simple" dog harness? She explained that normal webbing stretches when it becomes wet. That is certainly what we experienced with Dee Dee's Kong harness. She further told me that there is a specific type of webbing that is made to get wet and therefore will not stretch. 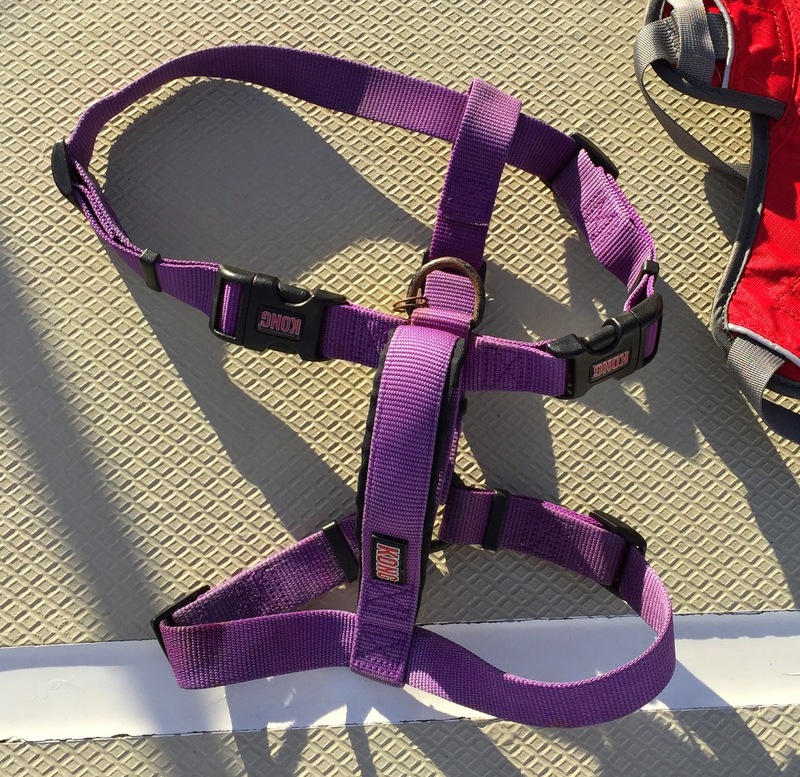 This is what Ruffwear uses on their life vests. 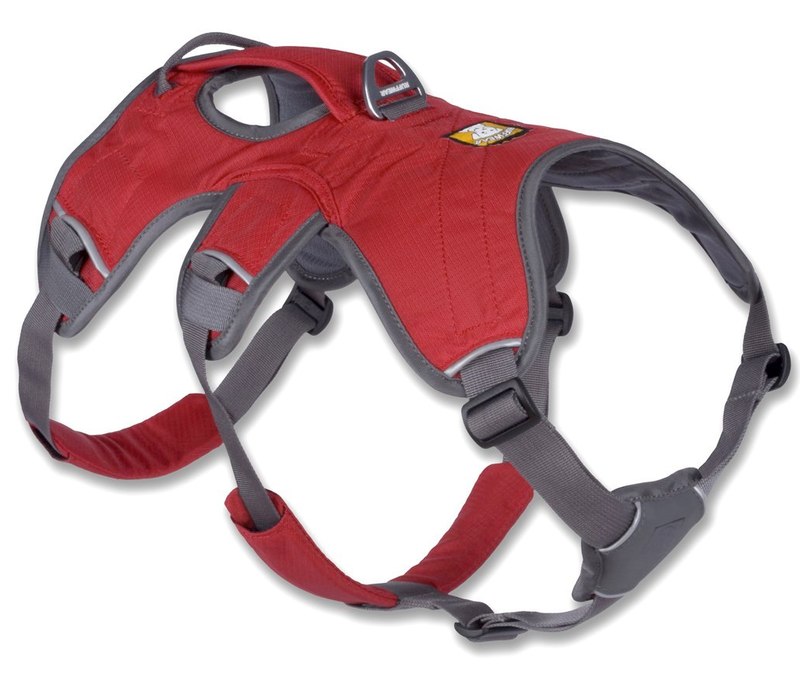 Their harnesses are designed for hiking, climbing, etc. where the webbing may become wet due to rain or crossing a stream but not submerged for long periods. Those harnesses are not made from the waterproof webbing. 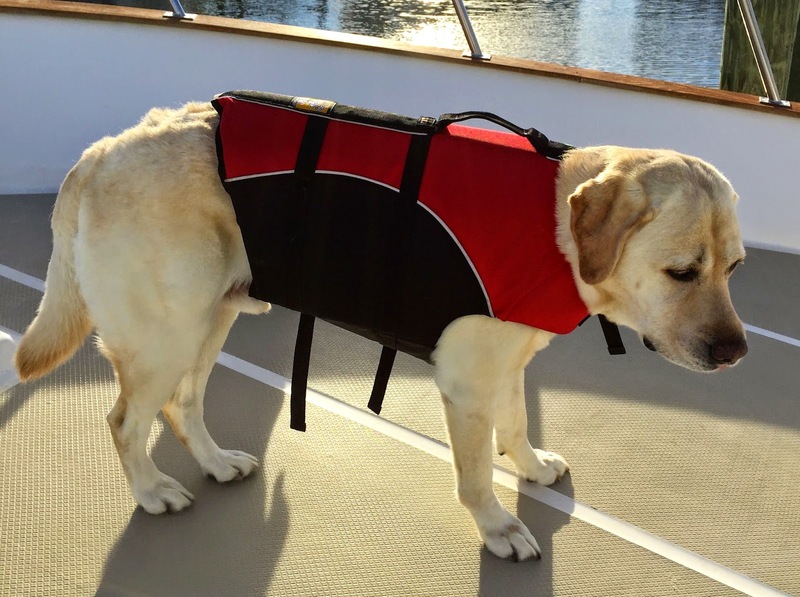 Susan stated that if we wanted maximum safety, the dogs should be in their life vests. I know she's right but our crew lives onboard so comfort must be taken into consideration as well. Like all things boating, these products are trade-offs and each of you must make your own decisions. 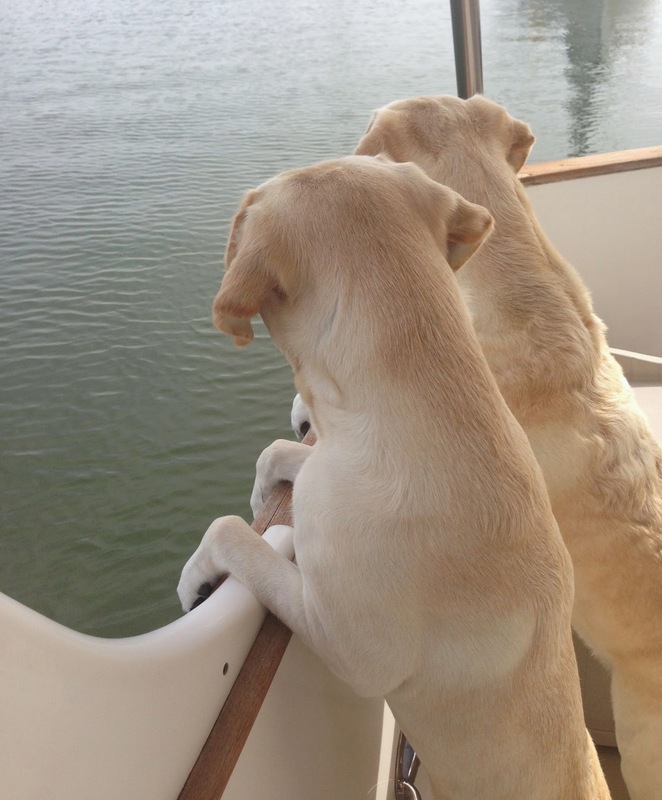 Labs are very strong swimmers and are at risk of overheating due to their heavy undercoats. While we certainly appreciate the added safety, we also know that a device that is not used is the most unsafe of all. Plus while the Kong failure was certainly disappointing, it did function well enough to get her back onboard. So we decided to try the Ruffwear Web Master Harness with the idea that it would provide better protection than the Kong. What I like about it is that there are 3 points that secure the dog - around the neck, behind the front legs, and at the belly. I like that each of the points have added padding where it secures the dog including the 3 point pad on the chest. While the webbing is still likely to stretch, the entire back is made out of a canvas material meaning less of the product would be prone to stretching. Overall, it is obviously a better quality harness. As for the negatives, Susan pointed out some areas of concern. She said this webbing will stretch when soaked - the question is how much in a real situation. She also indicated that the harness was designed for assisting a dog over rocks, up hills, etc. while hiking and not to lift them out of the water. The main design feature being the placement of the handle. 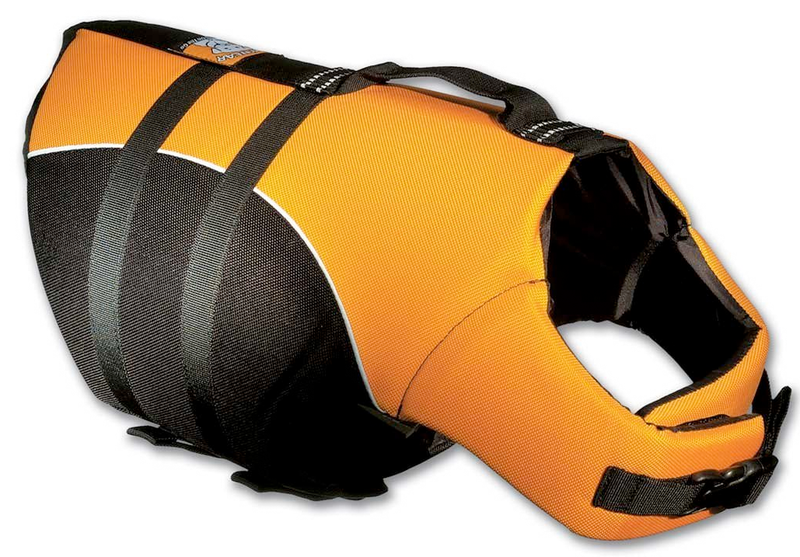 Notice that on the life vest the handle is directly behind the head. 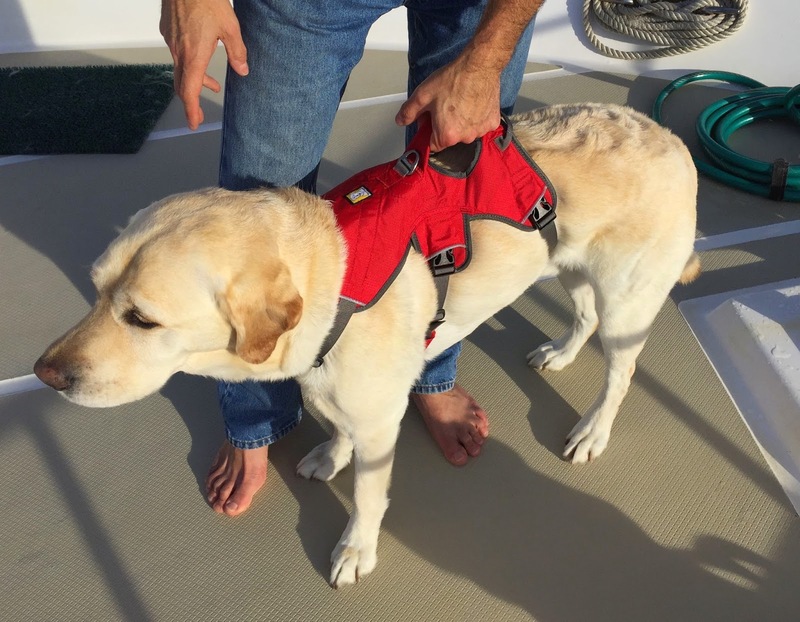 When you pull the dog up you are lifting the head up and out of the water while also positioning him so that the front paws can be used to scramble onboard. 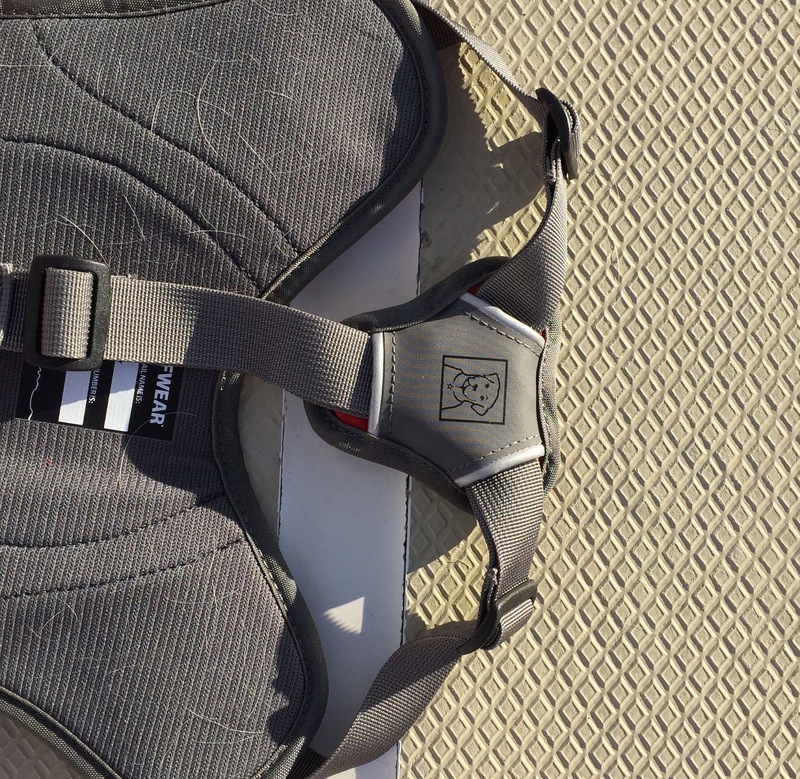 The Web Master harness has the handle further back so that you can better lift your dog's rear end to assist your dog up and over an obstacle. These are some clever designers. The question is, how well will it work in our application? We acquired two harnesses and have done some preliminary tests. We will not be in the Bahamas until next month where we plan on doing extensive tests with the harness and the life vest in a full swim. We won't allow our precious crew to swim in a marina. Examining the harness closely confirmed that it was a quality product. We were able to fit the same size to Dee Dee and Dylan by adjusting the straps. I found the third belly strap tricky as setting it snug when they were standing made it too tight when they sat down. I fiddled with the fit until I found a good compromise and will see how it works when we take off and they wear them all day. We tried lifting each one and found that their heads do not tilt up but rather stay flat. We need to test this live from the boat to see how much of an issue it will be. Then we soaked both the Kong and the Ruffwear harnesses for several hours in a bucket of water to test stretching. Both stretched somewhat when we then pulled on them but not nearly as much as we experienced during Dee Dee's swim. We speculate that the combination of being wet and 30 minutes of vigorous swimming caused the extreme stretching. Another test is needed in the Bahamas. 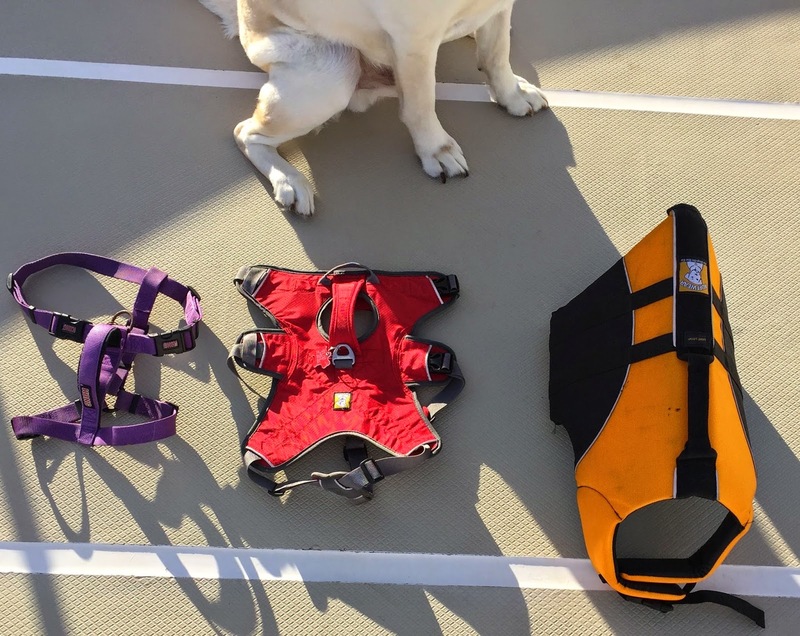 Our conclusions so far are that any harness is better than no harness and that the Ruffwear harness is clearly a more substantial one and very likely will outperform the Kong in live tests. We leave in a little over a week moving south again so we'll be able to test the comfort of the Ruffwear on the crew. Then a few weeks later the ultimate test when we take them swimming and even "rescue" them from the dinghy when we are in the Bahamas. For now, there will be strict rules enforced against any crew member venturing on deck unattended. And sorry guys, you can't attend to each other. Once again, thank you for so generously sharing your experiences, learning, and knowledge with all of us. We miss you guys! We are planning our trip fall 2016. Our Australian Shepard will be three at that time. Totally undecided as to him making the trip. I want to bring him but I question will he be settled enough and fair to him for the confinement. Do not hesitate to bring your four-footed family along! They will love the adventure but mostly love being with you. We've cruised with four different dogs and can't imagine doing it without them. It is not confinement it is adventure - new places, new people, different places to visit ashore. Compare that to the typical dog's life. We have found the Bahamas to be one of most dog friendly places we've found. You can take them pretty much anywhere and after a good run or swim on the beach they will be the most settled you've ever seen them. Dylan and Dee Dee hope to meet your babies some day soon.